Published on April 2, 2011 in Outreach. Closed Tags: donations, Outreach, split the plate. This year Holy Cross has started a new outreach effort, dividing the open offering receipts each Sunday equally between support of its own operations and donation to a designated project or charitable group. The recipients have been in the local community, in wider the state of New Hampshire, national and international. Some are church or faith based, others are not. Holy Cross is not a large or rich church. In absolute terms the amounts we donate are not large. But they help the recipients, they raise our own consciousness of needs in the world and the groups working to meet them, and they have a symbolic significance: we do not live for ourselves alone. What’s remarkable is that people have put enough money in the alms baskets each Sunday that the half going to Holy Cross has actually increased over last year’s collections. Recipients are suggested by parishioners. New Hampshire Food Bank: $128. 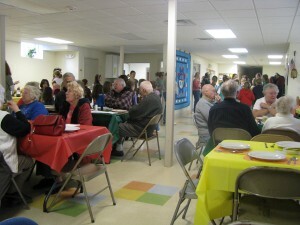 A program of New Hampshire Catholic Charities, the New Hampshire Food Bank serves as the only Food Bank in the state. Its current approach to ending hunger includes developing programs to help educate its registered agencies, rolling out a Mobile Food Pantry, expanding its Cooking MattersTM program, and developing its Recipe for Success program. Every year, the Food Bank distributes over 6.5 million pounds of donated, surplus food to 412 food pantries, soup kitchens, shelters, day care centers and senior citizen homes. These registered agencies in turn provide the food to the over 127,200 different men, women and children throughout New Hampshire each year. 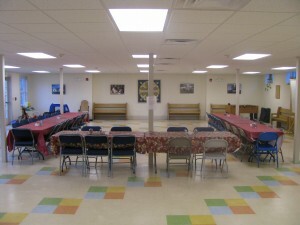 For more information: http://www.nhfoodbank.org/. 4,500 children and families, older adults and people living with disabilities served annually. Program outcomes exceed national performance standards. New Hampshire Business of the Year Award 2006 for Excellence in Non Profit Management. New Hampshire Business Review’s, “Business Excellence Award 2003”, for Outstanding Achievement in the Nonprofit sector. Volunteer NH’s, “Volunteer Champion Award 2003” in the small nonprofit category for our outstanding ability to successfully manage volunteers. Walter J. Dunfey Award 2003, for Excellence in Nonprofit Management. Weare Food Pantry: $186. 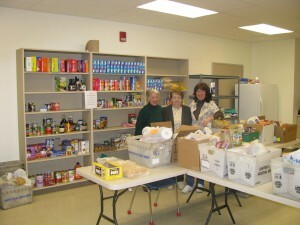 The Weare Food Pantry serves the people in Weare in need of food and other items. It is open Wednesday evenings from 5:00 to 7:00 at the Weare Middle School. There is also now food available at the Weare Community Thrift Shop for those unable to get to the Wednesday deliveries. At Christmas they were able to give 75 Christmas dinners and supply food throughout the month for 97 adults and 63 children. This is the most served since the pantry opened seven years ago. There is currently a gift cabinet which holds gifts for any child whose birthday falls in that month, if the family need is there. 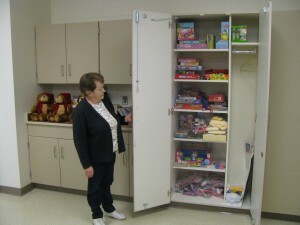 The Pantry is therefore always grateful for toys for both smaller and older children. (At the present time, they have enough toys for ages 5 – 8.) Another new addition is that volunteers currently make birthday bags which include all you need for a birthday party, including the invitations and birthday cake mix and frosting. The pantry is currently most in need of deodorant, shampoo, conditioner, toothpaste, dish and laundry detergent and toilet paper. Recently, the volunteers at the pantry have been able to purchase gas cards, as there is always a need in that area. Over the years of its operation, all by volunteers, there has been continued growth in the services provided the Weare Food Pantry. They have worked hard to keep current with the needs of local families. ChIPS (Children of Incarcerated Persons) Program of the Diocese of New Hampshire: $185. Together with other congregations in the Episcopal Diocese of New Hampshire, Holy Cross participates each fall in the ChIPS program, collecting toys, books and money to purchase gifts for children of the men and women in the state’s correctional institutions. This year we decided we’d get a leg up on ChIPS by designating the program for donations in the winter as well. The ChIPS program has been operating for a number of years now and helps keep families of those in corrections together. Gifts are collected at the Diocesan Convention each November, sorted by volunteers who then help inmates select appropriate ones for their children and wrap them for presentation at family Christmas parties. We Are Animal Guardians: $104. Founded in December of 1996, WAG is an all volunteer animal rescue and adoption organization based in Weare. It is dedicated to providing humane care and shelter for abandoned, abused and unwanted animals, finding them suitable new homes, and increasing public awareness on the responsibilities of pet ownership. WAG operates without a physical facility or paid staff. Its animals are in WAG approved foster homes until a suitable adoptive home is found. It uses a detailed application and interview process in an effort to make the best match between the animal and an adoptive home. It also has a “Home to Home” adoption process which allows the pet to stay in his current home until a match is made by WAG or the current owner. All WAG pets are current with shots; spayed or neutered if appropriate and have been thoroughly examined by a vet. It works with pure breed rescue organizations to find homes for its pure breed friends. WAG utilizes many forms of media including the web to spread the word and fulfill our mission. Its operation is funded entirely by donations. WAG is a 501 (c)(3) non-profit corporation. Piscataquog Land Conservancy: $ 76. The Piscataquog Land Conservancy (formerly the Piscataquog Watershed Association) is a regional land trust that protects almost 5,000 acres within the 11 towns comprising the Piscataquog watershed, including hundreds of acres in Weare. Many Holy Cross members belong to the PLC and a number volunteer to help with its activities, including John McCausland and Arthur Walmsley, who have served on its board and Will Townsend who works in the PLC office a day a week on computer mapping projects. The PLC’s main means of operating is through conservation easements, by which a landowner donates or sometimes sells development rights to the PLC which then monitors the affected land in perpetuity to make sure that the land remains undeveloped. Protected land can be used for recreation, farming or logging, as an owner designates; it just cannot be built on (except for designated exceptions, usually the owner’s home). Land conservation benefits wildlife, hunting and fishing, recreation, scenic beauty – and keeps taxes down. The PLC’s web site, with more information, is http://www.plcnh.org/. American Committee for K.E.E.P. : $ . In the wake of the earthquake, tsunami and nuclear power disasters in Japan, we included a project that the Episcopal Church began in that country in the wake of the devastation of World War II. The Kiyosato Educational Experiment Project (KEEP) is an economic and community development project rooted in Christian faith. KEEP was founded on four ideals: Food, Health, Faith, and Hope for Youth. KEEP added the principles of environmental education and international outreach to their advocacy work in the 1980s. But the mission remains constant: to offer program participants and visitors alike educational opportunities resulting in a new perspective, a stronger spirituality, a deeper cultural understanding, a richer appreciation for the ties that bind all people, and a call to serve others. KEEP is located in the part of Japan affected by the earthquake. It has responded by offering emergency housing and a place to rest and recover to families who lost their homes, providing bedding and supplies for shelters and transportation for people to secure medical help, and raising money for partner agencies engaged in relief efforts. You may read more about KEEP and its work at its web site: www.ackeep.org. Published on March 8, 2009 in Outreach. Closed Tags: Add new tag, MDG's, Outreach. For the past two years, Holy Cross has sent an amount equal to 0.7% of its income to support two aid and development projects in Africa. 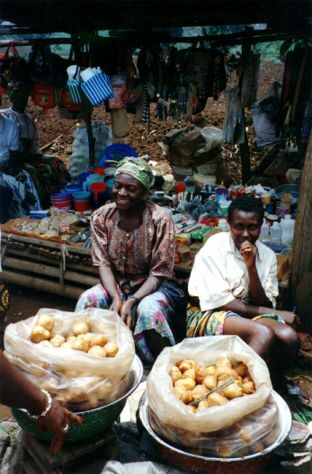 KWIHEED supports microentrepreneurs like this woman, selling produce in the marketplace. The first is WINHEEDCAM, formerly known as KWIHEED, a microcredit development agency operating in Cameroon. It was founded by Concord doctor Munro Proctor, who found in the course of medical mission work that economic development was the foundational need of rural people in Cameroon. 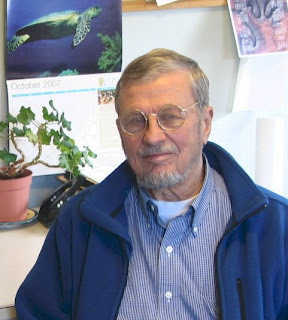 With Dr. Proctor’s retirement, his work has been taken over by an organization called endPoverty.org, which is a funding and oversight operation for a dozen or more locally based development projects in Africa, Asia, Eastern Europe and Latin America. The transfer will enable the continuation and expansion of the wonderful work WINHEEDCAM has done over the years. The second project we support is Masiphumele Corporation. Masiphumele operates in one of the poor townships outside of Capetown, South Africa. It provides leadership, organizational skills, training, and other support to community leaders engaged in home building, education, and other community activities. Like KWIHEED, Masiphumele has New Hampshire connections. It is the child of a Granite State couple who also have a home in South Africa. Both the national Episcopal Church and the Diocese of New Hampshire have endorsed the Millennium Development Goals of the United Nations, which call for devoting 0.7% of budgets at every level of society in developed countries to help the developing nations of the world attain educational, health and social goals by 2015. Published on March 6, 2009 in Outreach. Closed Tags: food pantry, Outreach, service. These are hard times for many folks, and we’re making a special effort at Holy Cross to support the Weare Food Pantry. The Pantry currently serves almost 100 families each month. It is located in the Weare Middle School and is open Wednesdays from 5:30 to 7:30 p.m. Holy Cross collects nonperishable items every Sunday, bringing them to the Altar as a special offering on the fourth Sunday of each month. Perishable items (margarine, cheese) can now also be brought on Sundays and placed in the small refrigerator under the sink off the Gathering Space. They will be delivered to the Pantry. Pantry volunteers pose before a recent Wednesday session. The Pantry now has a toy cupboard as well. Published on March 2, 2009 in Outreach. Closed Tags: gospel, Jesus, MDG's, Outreach. Holy Cross commits 0.7% of its income to organizations that work abroad to realize the Millennium Development Goals adopted by the United Nations and endorsed by the Episcopal Church. Bishop Arthur Walmsley, a member of Holy Cross, recently spoke about the connection between the Gospel and the MDG’s. Excerpts from an address at Trinity Church, Concord, MA, on February 22, 2009. The vision of the Millennium Development Goals is not new. For people who draw their faith from the Bible, it is as old as scripture. There is a Biblical mandate to serve God’s mission … and scripture offers us an understanding of the global crisis which has the potential to move us beyond the paralysis of the present to an affirmation and a way of being grounded in hope.